When you need to dig a trench, you are probably searching for the easiest way to accomplish this backbreaking work in the shortest amount of time possible. Reduce some of the effort by using a rototiller to break up the soil before you dig the trench. By passing the rototiller over the area where you need the trench first, you can then go back with a shovel and dig a trench in the dimensions you require. Determine the location of the trench and the dimensions required. Set the rototiller to a depth of between 4 and 6 inches. Start the rototiller and operate the rototiller over the area where you want the trench located to loosen the soil in this area. This will make digging and removing the soil much easier. 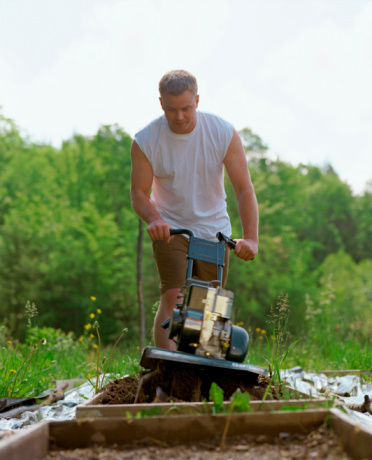 After you have loosened the top layer of soil in the trench area, turn the rototiller off and set it aside. Begin digging the trench with the shovel. You will find that the soil is easy to remove because the rototiller loosened it. Place the soil in the wheelbarrow as you dig it up. Continue to remove dirt and dig along the trench line until you have removed all of the loosened soil. Start the rototiller again and pass it over the trench area again if the trench needs to be deeper. This will loosen the next layer of soil to facilitate removal. Set the rototiller aside and dig out the loosened soil again with the shovel. Continue using the rototiller to loosen the soil and digging out the loosened soil with the shovel until the trench is at the desired dimensions.